Today we rented a car that could be driven in the West Bank and drove north to Nablus (site of ancient Shechem) and Mount Gerizim, the home of the Samaritans. 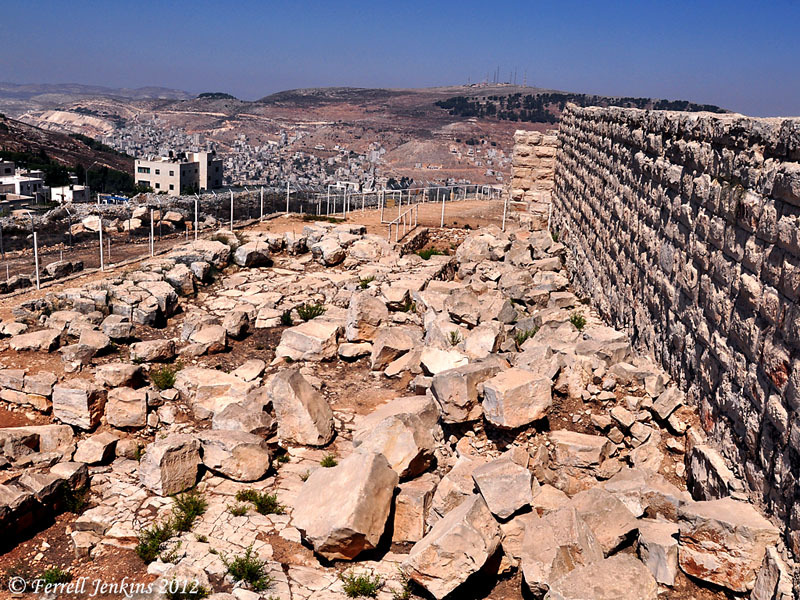 Samaritans believe the temple was to be built on Mount Gerizim rather than Jerusalem. They think Abraham offered Isaac on the mountain. They accept only the first five books (the Pentateuch) of the Old Testament. The blessings and curses of the Mosaic Law were to be read on Mount Gerizim and Mount Ebal once the children of Israel crossed into the promised land. It is fairly easy to get to the new archaeological park except for a few bad places in the road in the modern Samaritan village of Kiryat Luza. Rather than deal with the archaeological information, I thought I would share a couple of photos of some places of significant to the Samaritans. These are within the park. The first photo shows what according to Samaritan tradition is the altar on which Abraham was commanded to offer Isaac (Genesis 22:1-3). Remember that the Samaritans believe that this is Mount Moriah. Samaritan tradition identifies this rock as the Altar of Isaac where Abraham began to offer Isaac. Photo by Ferrell Jenkins. 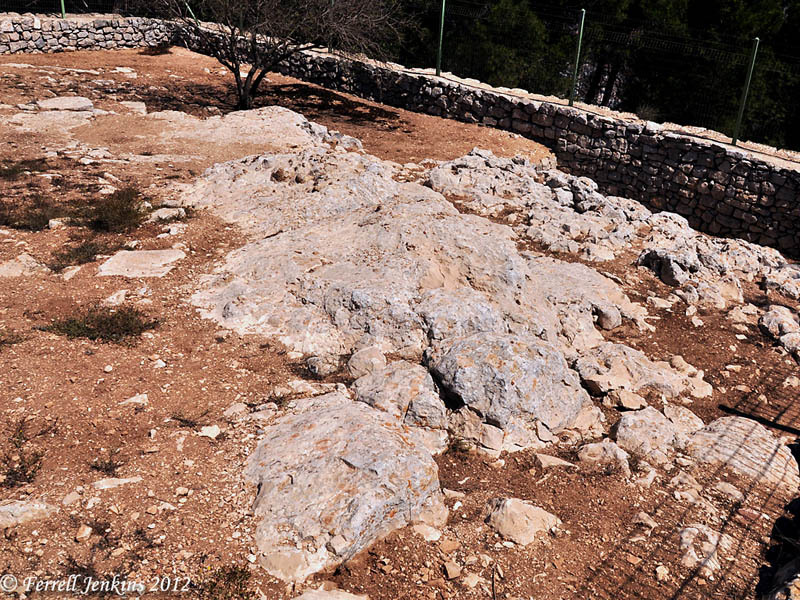 The next photo shows what the Samaritans call the “Twelve Stones.” Samaritans says that the Israelites built the altar they were commanded to built when they crossed the Jordan (Deuteronomy 27:4). The Twelve Stones, according to Samaritan tradition. Photo by Ferrell Jenkins. For more information about the archaeological park and the Samaritans see here. The park is under the direction of the Judea and Samaria Civil Administration and the (or of the) Israel Nature and Park Authority. If you have an interest in the historical information about the temples on Mount Gerizim, check this article by Yitzhak Magen, the recent excavator, here. An attractive brochure is available at the entrance to the park with text by Magen. It is a pleasure to see a brochure written by a knowledgeable person. This entry was posted in Archaeology, Bible Places, Bible Study, Israel, New Testament, Old Testament, Photography, Travel and tagged Samaritans. Bookmark the permalink. I created an itinerary for a tour from Jerusalem that began at the museum of mosaics at the Inn of the Good Samaritan, followed the scenic Allon Road to Mount Gerizim to visit the archaeological site and on the way back, ancient Shiloh, the site of the tabernacle. Ferrell, visiting Mount Gerizim reminded me that the remains of the martyrium there built by the Byzantine emperor Zenon in 484 CE is almost identical to the Kathisma church I showed you on the way to Herodium. She’s beautiful new banner for your blog!